Still believe that creating of a website takes some effort, a lot of money or even both variants at the same time? 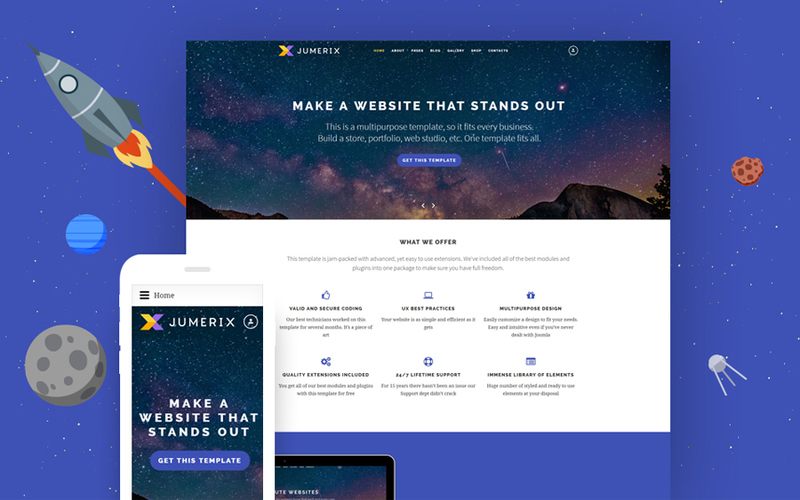 Well, you definitely need to learn more about Jumerix – an incredible Joomla template made for your comfort. 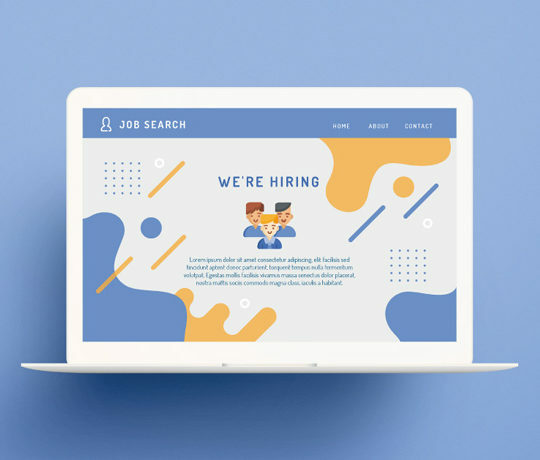 As you may know, templates are ready-to-use and professionally designed pages that allow you to build a high-quality website without hiring a web designer or developer. Sounds great and quite easy, doesn’t it? Moreover, there is another aspect, which makes the process of creation even easier! Truly speaking, looking for each feature for your website individually doesn’t seem to be the best way to spend your time. Needless to say, you also need a lot of money, so it makes choosing Jumerix a wise and expedient decision! Undoubtedly, multipurpose templates get the wind of the simple ones. Shortly, they are packages including different kinds of features for the appearance and further modification of your website. All in all in all, you get an extensive set of plugins and modules that could handle any resources with some heavy content. Easy in use and installation, the template was built with semantic, valid code. It will be an irreplaceable helper for building your online shop, personal blog, informative forum, interactive gallery or just an advertisement website. Dropdown menu, newsletter page, Google maps, different kinds of Google fonts, Swiper slider and social block are also added to the package. Although all the installation instruction are included and based on ‘Documentation’ folder, we provide you with 24/7 technical support, so all the questions will be answered as well as all the issues solved. What is more, Jumerix was diligently created by TemplateMonster. It contains high-quality pictures for showing the whole beauty and potential of your content. 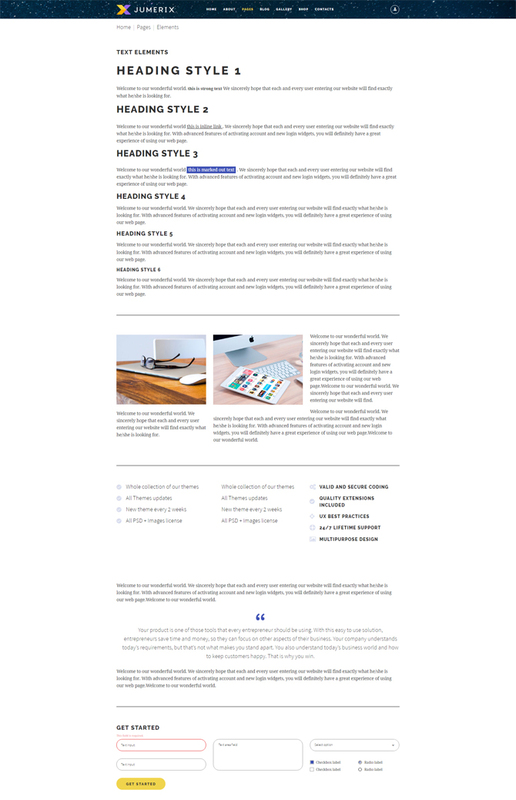 As you may see, a modern design of the template in question corresponds to all the newest web trends and remains unique at the same time. Let’s take s closer look into this Multipurpose Joomla Template! 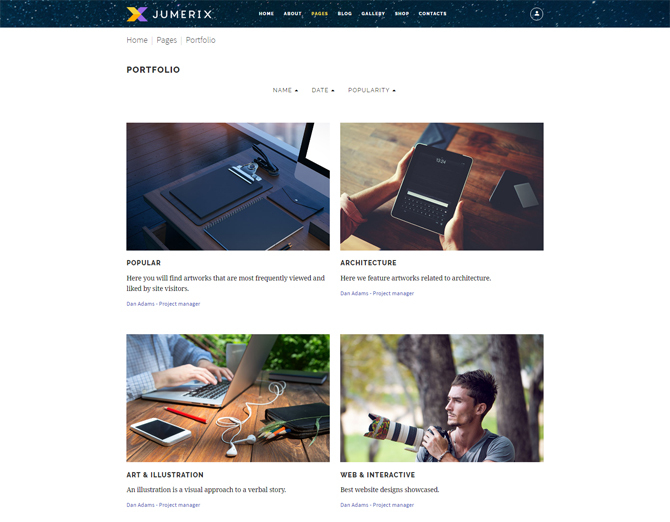 Jumerix template gives you a long-awaited chance to become your own boss. 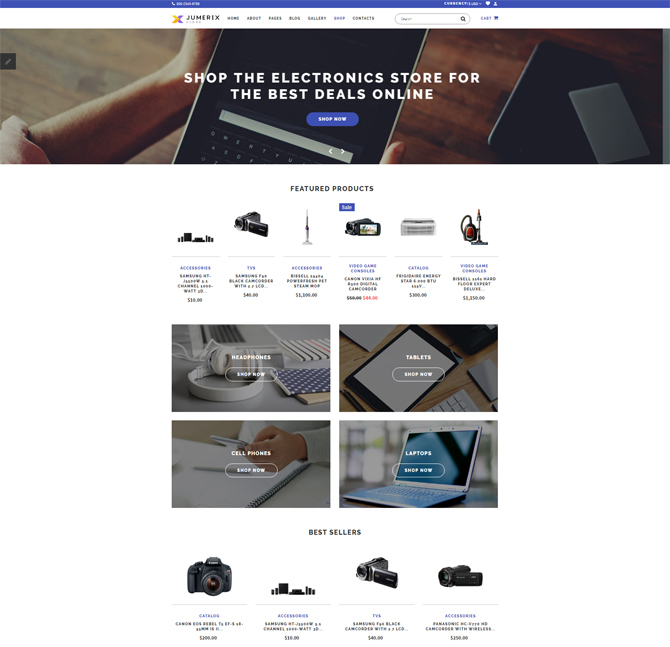 Now it is possible to create the website of your dream with a set of pre-designed pages for online shop and full VirtueMart integration. Talking about this powerful Joomla theme, do not hesitate as there is nothing easier that starting your web store out-of-the-box. Needless to say, visual presentation of store products always looks more attractive, but list undoubtedly provides more information to your visitors. Let’s give the world to see your service from all the sides! 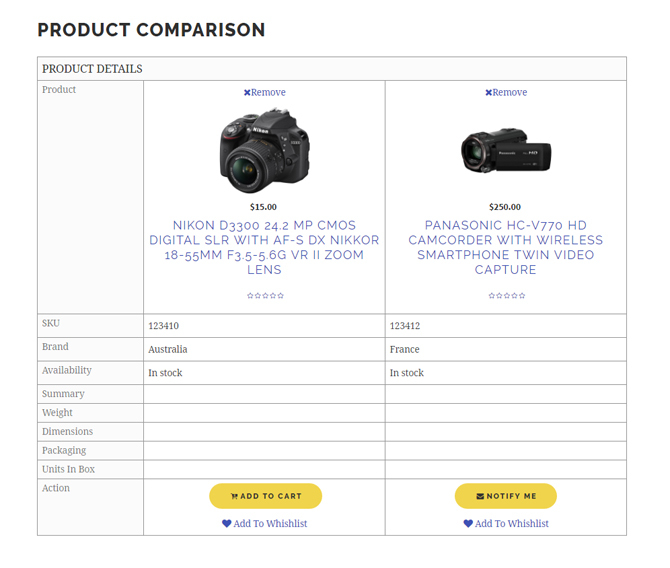 For many years of web shops existence product comparison became an important and even indispensable part of any professional website. Undoubtedly, this function saves the time of your customers and helps them in making the right choice. Wishlist is another important part of any web store. This feature allows your guests to tag some products they like and add to wishlist for making further decisions. Moreover, the number of items one could tag is unlimited what makes your shopper feel free in his wishes. For today this new feature became truly popular because of its’ comfort using and perfect appearance. The option allows you to add different images or promo banners to the menu, group your links in the columns and paste here any other elements. Would you like your website to be brighter? Then this feature was made for your needs as it helps to get a remarkable presentation of your products. Have you ever been afraid of modifying websites with a rich content? Here is another feature made for your convenience as you can keep all the pages uncluttered during organizing the content into carousels. 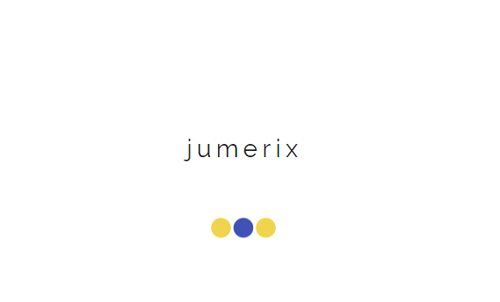 Jumerix has a spectacular palette of bright, deep and soft colors for any taste. 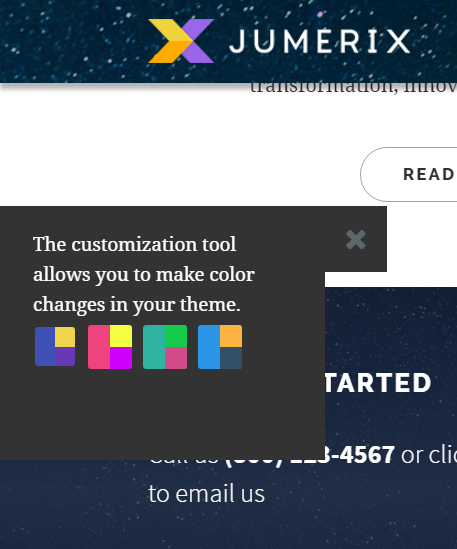 Surely, this customization tool allows you to make color changes in your theme. 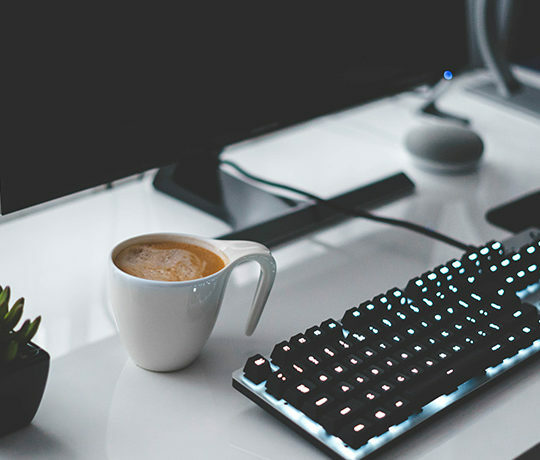 Parallax Scrolling is a fairy recent web design trend, which involves background moving at a slower rate to the foreground and creates a 3D effect when you are scrolling the page. This trendy option makes your website look modern and attract your customer’s attention. Furthermore, there is another way to get your visitor’s interest. With the help of this useful feature you may add to the template of your website any video that you prefer. As you can see, a charming neat gallery harmonizes with a marvelous space menu. 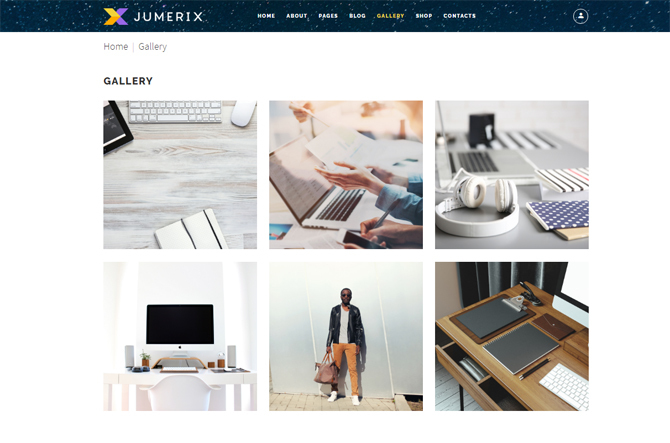 By the way, Jumerix gallery has the quick view option and hover effect made for more comfort. Just take a look on this excellent example of minimalism connected with style! Today, with the using of our Joomla template, you may get a perfect gallery with no effort. In addition to shoots description you may track the popularity of your pictures. This practical feature lets you display any location and places with the help of a build-in Google map. Undoubtedly, such step will expand the audience of your service. Would you like your website to be unusual from any side? Then this option was added for you! 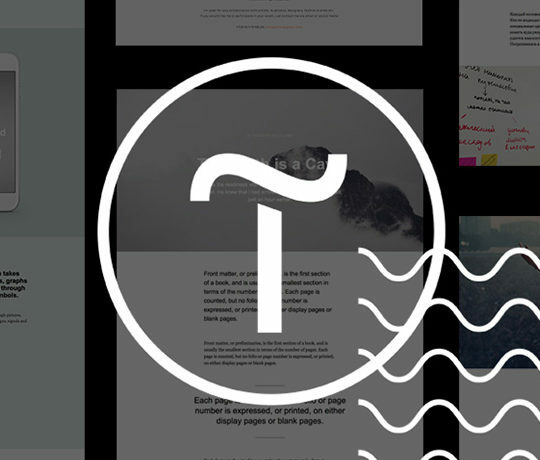 Pre-loaded into a package, Google fonts and icons will surely relieve the appearance of your pages. As you may know, a preloader is an image, signature or any other contest teaser, which appears during site’s loading instead of the blank page. Thus, your visitors know that the website works correctly and showing of content is in progress. Don’t you think that it’s a good idea to display the latest updates of your social networks’ profiles? 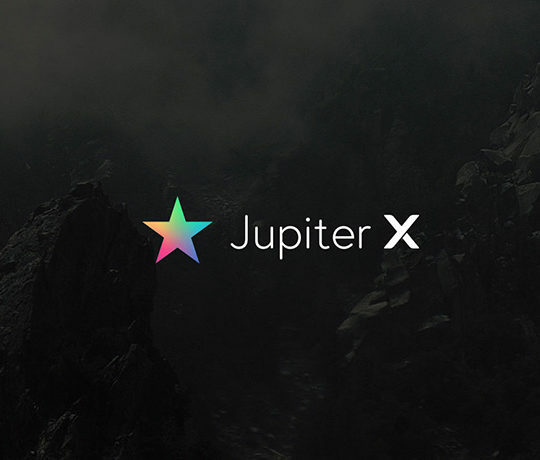 For this reason, the Social Blocks feature was included in the package of Jumerix. Don’t make your customers wait for the opportunity to visit your site! Using the social login feature will certainly help people to join your service with one click. Although reading of articles or description may be useful, people still prefer face-to-face conversations. Seeing that, we propose you to use online chat, which will help your guests to get the information in question as soon as it’s possible. This easy feature allows your guests to leave some questions, reviews, opinions and other comments on your website. Sometimes reading descriptions and watching pictures may be boring for your customers. In this case, let’s add some activity! All in all, letting people leaving their opinions or just writing some thoughts about your service is a good chance to raise the statistic of your website. Cookies are the small files placed onto visitors devices that help to develop your website. For example, with its’ help you can see, which devices people use to enter your website. Actually, this is a usual thing for online shops, but wouldn’t it be right to inform your guests about using cookies? 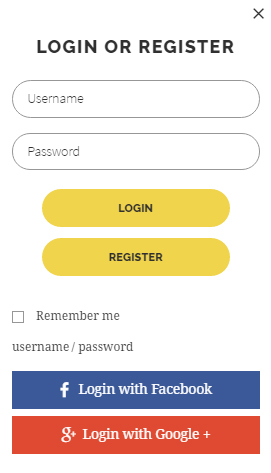 Here is another easy but valid function for your website as with the help of newsletter form you let your customers subscribe to your updates in one click. This is your personal ‘One Ring’, which allows you to control all the Jumerix pages and modules. In a word, this feature will show you all the user interface elements and provide with a clear description of them. The speed of your website loading is quite important detail for your customers as well as for your business, isn’t it? For these reasons Jumerix provides you with Google speed optimization feature, which helps your site stay quick and powerful. Don’t forget to see the videos below! They were made in order to tell you more about Jumerix. Additionally, feel free to visit TemplateMonster service center to get a professional consultation about transforming your ideas into a powerful and unique website of your dream as we provide you with the templates customization. 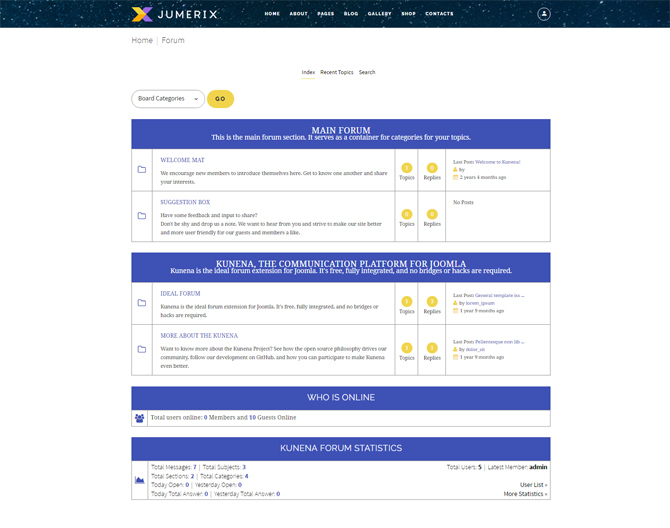 In conclusion, what is your opinion about the Jumerix design? Is it eye-catching enough for a wide audience? Maybe, you have already used Jumerix and have some opinion to share? Don’t hesitate to leave your thoughts, questions or advices below this post!